Like every year, GUADEC has snuck up on me. I’ll be heading out to Manchester in a handful of days which means things are going to get hectic any moment now. We just reached another milestone in our development phase towards 3.26. I’ve landed two important components which will have important roles in Builder’s future. The new visual layout, and the new shortcut engine. Neither are complete yet, but they are good enough to land on master and allow us to iterate without giant branches. The new layout is based upon a design iteration lead by Allan which Andreas, Jakub, and myself took part. Not everything is implemented but the parts which most heavily contribute to user workflow are in place. The new shortcut engine has also landed. This is a monumental amount of work because it completely overhauls the keyboard input model within Builder. We’ve moved to a “capture and bubble” event delivery for keyboard input so that we have more flexibility in how shortcuts are activated. The event delivery is in one of three phases. Capture, Dispatch, or Bubble. The capture phase allows the widget hierarchy (starting from the toplevel) to handle an input event before the destination widget. Dispatch is delivery to the expected destination, where GtkBindingSets are activated. Finally, the bubble phase allows the hierarchy to handle the event if nothing handled it previously. This also includes a whole swath of features around it for user-modifiable shortcut themes, custom keyboard controllers, a shortcut editor and more. 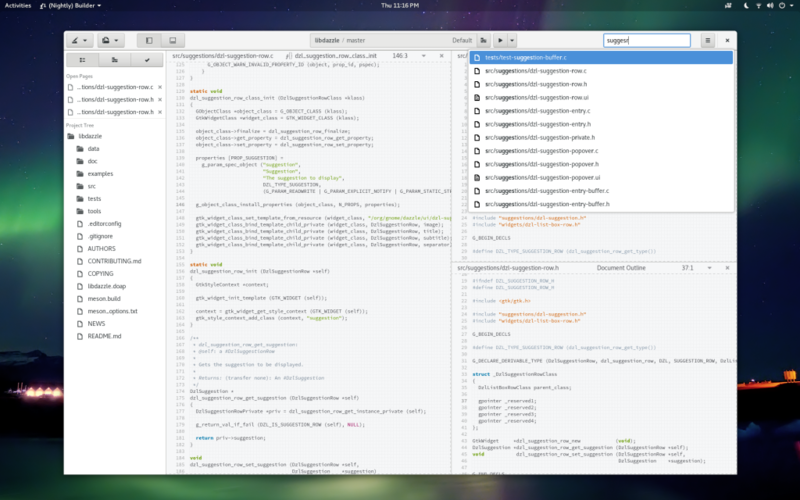 To simplify the process of merging into Builder it has a compatibility interface to support CSS-based -gtk-key-bindings properties. Effectively, bubble/capture allows us to have keyboard shortcuts that only activate if the source editor or terminal have not stolen the input. A convincing Vim implementation for our source editor can really benefit from this. I’ve been aggressively pushing forward our new layout branch to integrate the new design work we’ve been iterating on. I don’t think we need to have it all done to merge to master, so we are rapidly approaching the time-frame for the branch to land. There is much from the design still missing, but every day more pieces come together. I expect to have a good portion of it done by GUADEC. A lot happened this week on the wip/chergert/layout branch. Here are some highlights. Georges landed a “focus mode” fullscreen mode for Builder. We’ve landed a patch in flatpak-builder to update terminal titles. This will allow us to scrape that info via the PTY in Builder for better progress messages. Document titlebars now match the primary-color of the content. We also fade between states. This took some craftiness to avoid cascading the entire CSS tree. Video example below. DzlPropertiesGroup is a convenient GActionGroup implementation for exporting multiple object properties from a GObject. This is more convenient than GPropertyAction when you are exposing lots of properties together. The TODO plugin was ported to C and employs various techniques to use reduce memory overhead. Dazzle gained convenience API to do insertion sort on a GtkListStore in O(log n) time by accessing the GSequence directly. 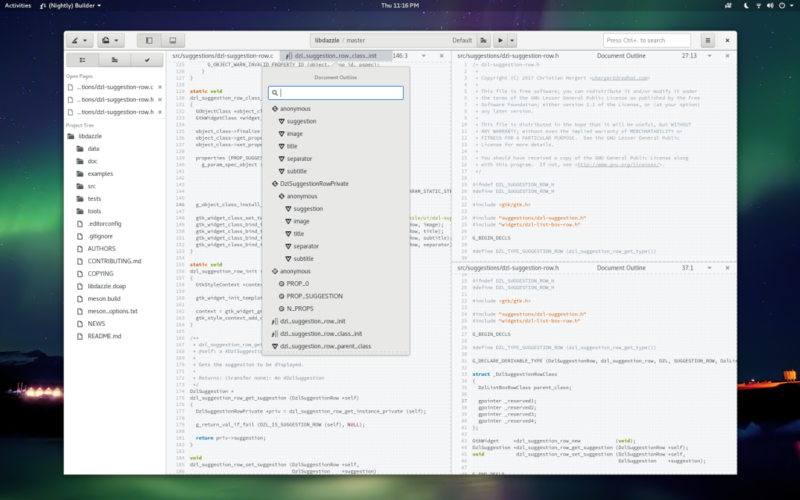 This should be a safe layer-violation on Gtk+ 3.x. 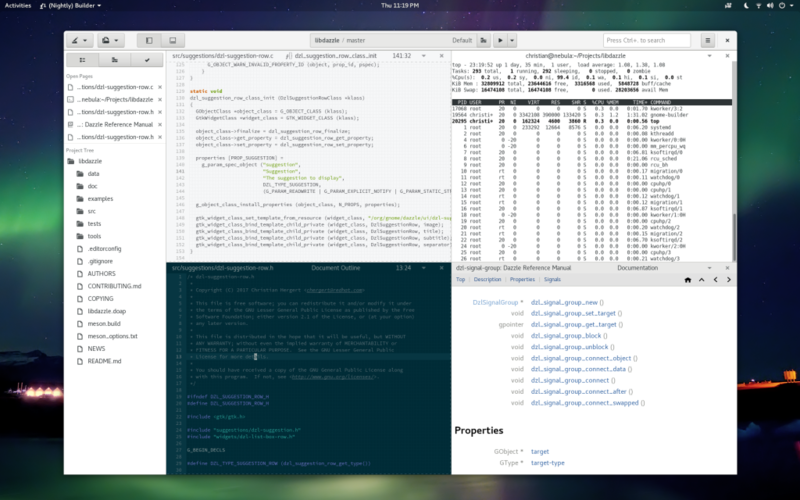 Terminal, Devhelp, and HTML-Preview were ported to the new layout design. IdeSymbolResolver gained a “find nearest scope” API which is used to update the scope name in the document titlebar. Both C and Vala are supported. Other languages need an implementation still. The project tree was tweaked to look more like the mockup. While this won’t be our default project-tree for 3.26, we will keep it around and therefore it should match the design. Overview map was ported to the new layout design. Plugins should use the new IdeBuffer::change-settled API to be notified of when they should update their state based on buffer content (unless alternate API is provided via the plugin interface). We’ve added type icons to the devhelp search that match the language-feature icons used elsewhere in Builder. Scrolling to the insertion point on buffer load has been vastly improved. Performance of buffer loading has also improved. Todo and build diagnostics have been ported to the new design. GtkListBox is a fantastic widget. But there are some things it does not deal well with today. I presume that once it can deal with only keeping a minimum number of widgets in memory (and the size-request magic that goes with it) it would be a better solution. Builder keeps a lot of widgets active during the lifetime of the application, and that makes style propagation particularly slow. The fewer widgets we can use, the more responsive we can keep things. (And of course, there are multiple ways to do this).